Queen Victoria drank Canadian Club... as did fictitious British secret agent James Bond. At its peak, Canadian Club was among the most recognized products in the world. Any material from the Hiram Walker archives has to start with the history of Canadian Club whisky, the brand that established the Hiram Walker distillery and the town of Walkerville, and made them famous throughout the world. Canadian Club whisky was an ambassador not only for Walkerville but for Canada. Queen Victoria drank Canadian Club at the end of the nineteenth century, as did fictitious British secret agent James Bond, seventy-five years later. At its peak, Canadian Club was among the most recognized products in the world. When Hiram Walker founded his distillery in the wilds of East Sandwich in1858, most whisky was sold in barrels. Brand names, however, were beginning to make an impact on the industry. Brands such as "Monongahela" from Pennsylvania had already become well known in the eastern United States. Walker was brand conscious from the outset. His first brand of whisky was called "Magnolia," most likely named after a town in Massachusetts, not far from his hometown. Although not very successful, the brand was available from the distillery from 1858 until around 1900. Incredibly, by 1882, the distillery offered twenty-seven different whisky products for sale. Brands such as "Walkers Old Rye," "Toddy," "Family Proof," "Superior," and "Excelsior" were just a few. Although these brands achieved moderate success, Walker knew he needed one key brand to ensure lasting success in the distilling field. One brand that appeared at this time was called "Three Star". By the end of 1881, the brand was known as "Three Star Club". Within a year, the "Three Star" was dropped, and by 1882, the brand was changed to "Club" whisky. In April 1882, Walker registered "Club" as a trademark for the customary fee of $25. Walker hoped this would be the name that would secure his fame and fortune for himself, the distillery and his fledgling town of Walkerville. Walker positioned his Club as a premium brand- it was promoted not only for its purity, but also for the time it was aged  a full seven years in oak barrels, unheard lenght of time in that era (US bourbons were aged for less than a year  if at all). Early price lists show Club was considerably more expensive than any other brand offered by the company. Club was not an instant success  like the barrels it was aged in, it took time for the market to catch up to Walkers genius. In 1882, only 43 barrels were sold, compared to 15,000 barrels of Walkers Old Rye. Surprisingly, a government intervention cleared a path for Clubs success. In 1883, the Canadian government passed the "Bottled in Bond Law." Distillers were able to bottle whisky with a Canadian government excise or strip stamp, so in effect the Canadian Government was guaranteeing the age of the bottled whisky. No other country in the world employed such a system  the US did not follow suit for another 13 years. This simple process gave consumers confidence in whisky products and made Canadian whisky famous throughout the world. With a new method of packaging and marketing whisky, Canadian distillers delegated their best or most innovative brands for bottling. Hiram Walkers first bottled and bonded whiskies were Old Rye and Club. Distilling whisky was a very competitive industry and sales of Club were less than stellar. In 1884, only 87 cases were exported to the USA. By 1890, this figure had climbed to only 4,817 cases. But heavy advertising and hard work led to steady growth; by 1915, the number of U.S. exported cases was a respectable 137,353 cases. In 1889, a significant and pivotal change occurred to the "Club" package. The word "Canadian" was added to the top of the label, set in block letters. Canadian referred to a type of whisky (as opposed to Scotch, Irish or Kentucky). Canadian whisky, as pioneered by Walker, was a blend of neutral corn spirits and rye flavouring spirits blended together before storage in the barrels. Bills for mash, (the leftover matter from distilling), from the early 1860s confirm that this method was employed by Walker from the earliest days of his operation. Walker was now using his methods as a way to promote his products in the USA. A common myth is that the U.S. government forced Walker to insert the word "Canadian" at the insistence of American bourbon distillers. Research done to date finds no evidence to support this notion. In 1882, sales of Canadian whisky were so small that Washington hardly needed to take action. No matter, as it makes for a great story and secured the legend of Hiram Walker as an astute businessman. What is known is that Walker always printed the words "Canada" or "Canadian" from the beginning of bottling operations. In 1890, Club whisky changed again. 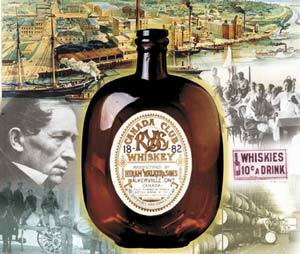 The distillery fully incorporated Canada into the products name and the brand was then called "Canada Club". The brand was bottled in a pumpkin seed flask. This unique bottle was on the market for a very short time, and is exceedingly rare and seldom seen. In 1893, another label change led to "Canadian" as the prefix to Club, with both words in what would become the companys famous script face. With that humble beginning, one of the best known brands in the world was born. This last change may seem obvious with the passing of time, but in fact, it was a mental exercise that took several years. The Canadian Club label, based on this simple format, was used by Hiram Walker & Sons for over 105 years. With the dawning of the 20th century, Canadian Club gained a solid foothold in the coveted U.S. market. But the new century would bring new challenges to Hiram Walkers sons, who inherited the business after Walkers death in 1899. The looming Great World War led to the closing of the U.S. border to Canadian whisky in 1917, dealing a blow to the Walkers. But this was minor compared to the passing of the Vollstead Act in 1920, and the gathering clouds of Prohibition  the complete banning of all manner of drink throughout North America. Walkerville would soon be ground zero for smugglers and rumrunners  but that, as they say, is another story!